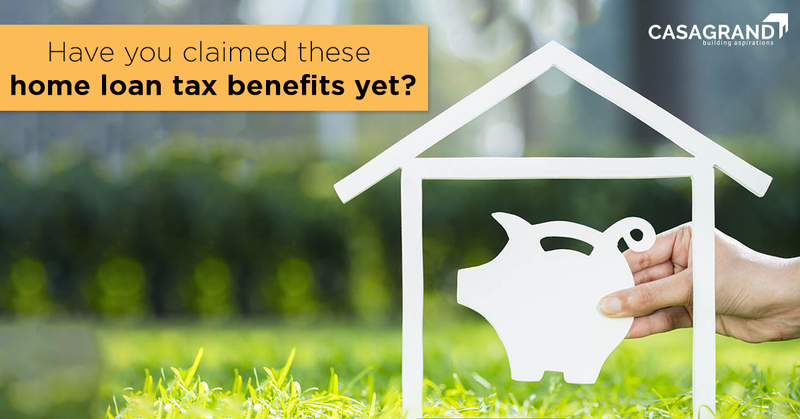 Have you claimed these home loan tax benefits yet? A dream for many, buying and owning a home is a common goal people work towards, the world over. There is meticulous planning and saving that goes into achieving this goal. Among the many things you need to take into consideration one is your home loan. However, while applying for a home loan brings you a step closer to realising your dream, it also comes with multiple tax benefits you can claim. Considering your home loan will be a large amount, being aware of these home loan tax benefits is crucial as you will be able to save a lot of money. Read on to familiarise yourself with these important home loan tax benefits. You can apply for a home loan for the purchase or construction of a new house. In this case, the construction must be completed within five years from the end of the financial year in which the loan was taken. Your housing loan’s EMI has two components – the principal repayment and the interest repayment. The interest amount can be claimed as a deduction from your income up to a maximum of Rs 2 lakh under Section 24 of the Indian Income Tax Act. If your property is self-occupied and the construction has been completed within five years, you can claim home loan tax benefit, i.e. an exemption up to Rs 2 lakh. However, if the construction time exceeds five years, the deductible amount drops to Rs 30,000. On the other hand, if you are renting out the property, there is no cap on how much you can claim as a home loan tax benefit, regardless of the property’s completion status. In case you have purchased a property still under construction and have begun paying the EMIs on your home loan, your eligibility to claim home loan tax benefits will begin only when construction is completed. Now you may think you will not be able to enjoy any home loan tax benefits during the period between borrowing the loan and construction completion. But let’s take a closer look. The Indian Income Tax Act has a provision under which you can claim deductions for such interest as well. Called the “pre-construction interest, you are allowed to make deductions in five equal instalments beginning from the year in which you bought the property or construction is completed. Here, the maximum eligibility is capped at Rs 2 lakh. You can also read our blog on what is pre-launch for more information. Section 80C of the Income Tax Act allows you a home loan tax benefit of Rs 1.5 lakh as a deduction. This deduction can be availed only upon complete construction of your purchased property. However, this benefit will be reversed if you sell your home within five years of possession. Your claimed amount will be added back to your bank account in the same year that you made the sale. Section 80C also gives homeowners the opportunity to claim deductions on the amount paid for various taxes and duties. This is regardless of whether you have borrowed a home loan or not. However, you can claim this deduction must stay within an overall limit of Rs 1.5 lakh and can only be claimed in the same year these expenses are incurred. First time homebuyers can also avail multiple home loan tax benefits up to Rs 50,000 under Section 80EE. This is over and above the deductions you can claim for principal and the interest under Sections 80C and 24. Bear in mind, however, that your property’s value must be less than Rs 50 lakh and the total home loan value must be under Rs 35 lakh. Additionally, the homeowner can only own one property and not multiple.